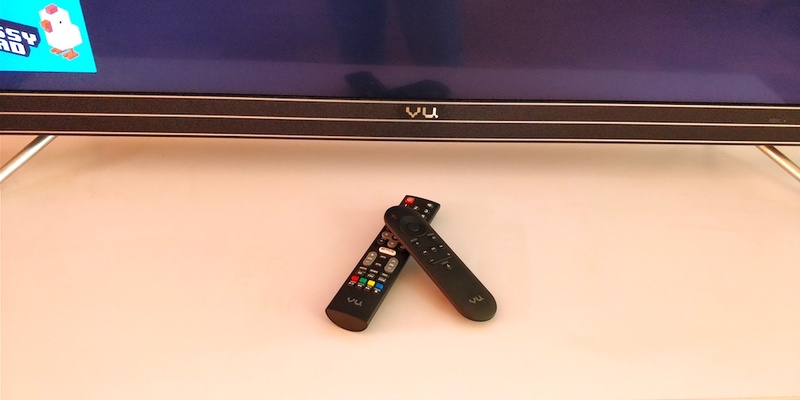 Vu TVs have made a name for themselves among the big boys of the television market. With the affordable data revolution sweeping the country, the consumption of streaming content has jumped many-fold. More and more people are investing in smartphones to stream on-demand entertainment. This data revolution is a big part of Digital India, where now even payments are going digital. When recently Xiaomi launched their trio of Mi TV 4 and Mi TV 4A, the focus has suddenly shifted towards smart TVs. Suddenly, quality smart TVs are available at very affordable prices. People are putting one and one together and, just like that, smart TVs are in demand. Among the many established players, Vu TVs have made a name for themselves among the big boys of the television market. Vu has recently introduced a new range of smart televisions called ActiVoice. They run on Android Nougat and prices start at Rs 36,999/- for the 43-inch variant. But the one we are going to look at today is the 55-inch variant which will be available for Rs 55,999/-. The ActiVoice range will be available in three sizes, 43-inch, 49-inch and 55-inch. All the three variants feature a 4K displays. They will be exclusively available on Flipkart starting from March 16, 2018. We spent some days with the Vu TV model no. 55SU134. It is a 55-inch smart TV which runs stock Android Nougat. Unlike the recently released Mi TV4 or the 4A, Vu has slotted their latest offerings in the premium category. Vu says that there is enough differentiation between the two brands to justify its higher cost. With that said, Vu’s gorgeous 55-inch display is a wonderful performer. 4K content at 55 inches has to be seen to be believed! The TV doesn’t disappoint on the audio front either. Its 20W soundbar supports DTS and Dolby and delivers loud and crisp audio. Since the TV runs on stock Android, it can boast of features like Google’s Assistant, built-in Chromecast support, Netflix, Google Play Store with Android updates and the ability to understand and execute voice commands through the supplied remote. Actually, this TV ships with two remote controls. One is a regular IR remote which also has smart function buttons and a big Netflix button along with the regular TV controls. The other is a smart remote control which connects to the TV via Bluetooth. So, it doesn’t need to be pointed at the TV for it to work. This one only has the smart controls. It also has a ‘Speak’ button and a microphone from where the user can issue voice commands. The voice commands work quite well and the TV understood our Indian English quite well. Overall, the TV seems to be a complete package. But is it worth the asking price? It bears some deeper delving to answer that question. Before we take a look at Vu’s offering, let us take a look at some hardware and software specifications of the Vu ActiVoice 55SU134. This one is easy. The 55-inch panel on the Vu ActiVoice is a beauty! The Ultra HD IPS display, with 3840 x 2160 pixels resolution, renders sharp pictures and the 60Hz refresh rate ensures smooth motion. It can also upscale HD content to 4K for a better viewing experience. The display has a wide colour gamut which delivers colourful, saturated pictures. Dynamic contrast ensures deep blacks and the High Bright Mode makes for a clear viewing experience in any lighting conditions. The Smooth Motion Control paired with the 60Hz refresh rate delivers crisp, jerk-free pictures and the wide viewing angles add to the usability of this TV. Additionally, the display also has pixel mapping and MPEG Noise Reduction algorithms for clearer pictures. To sum it up, the display is one of the better ones seen in this price range. Audio is yet another important part of the TV viewing experience. Nothing is more frustrating than having to deal with a good picture and terrible sound. But happily, Vu ActiVoice’s sound quality complements its picture quality. 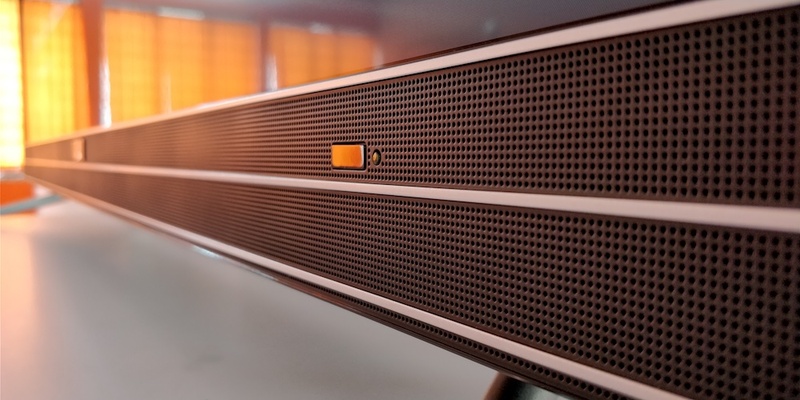 The two 10W speakers in the inbuilt soundbar give a total output RMS of 20W. The output is loud, but not harsh. The lows are especially strong. With support for DTS and Dolby, it also features DTS Surround Sound for a theatre-like experience. The audio output can be further tweaked manually, for your preferred output, or via the built-in sound modes like Rock, POP, Live, Dance, Techno, Classic and Soft. The Vu TV also delivers on the audio front and it would be especially fun to watch movies and sports events on in this TV. The Vu ActiVoice 55SU134 is a smart TV. It runs on stock Android which is an advantage as well as a limitation. The advantages of stock Android include faster updates, access to the Google Play Store, Chromecast support and Google’s Assistant. Netflix is a big part of this TV. In fact, one of the supplied remote controls features a big ‘Netflix’ button. The limitation comes in the form of content. E.g. Xiaomi has partnered with many local content providers to include almost 500,000 hours of free English and regional content. All Xiaomi’s TVs run its custom PatchWall UI interface and all these content providers are baked into the UI for a seamless viewing experience. The Vu TV misses out on this content aggregation. While it has YouTube and Netflix, it simply cannot match the depth of content offered by regional content providers. The other highlight of this TV is system-wide voice control. From opening apps to searching for content online, everything works as advertised. This is a highly convenient feature and beats using the remote control. You could ask it to play a particular movie on Netflix and it will do so without any issues. You can download and play games from the Play Store. You can cast your smartphone’s screen with the built-in Google Cast and stream content from your smartphone. The 55-inch Vu ActiVoice offers good value for money, but not more than the Mi TV 4. But it offers some features that the Mi’s offering lacks, like voice-control. It offers a wider compatibility with Android apps from the Play Store. The display is beautiful and the sound is deep. The Grade A+ display panel is a sight to behold when playing 4K content. At Rs 55,999/- it offers decent value for money over some of the bigger players in the market. But the Mi TV 4 is a game-changer. It offers almost the same specifications at a substantially lower cost. But, it is rarer than a Unicorn. With low inventory and the dreaded flash sales model, the Mi TV 4 doesn’t come across as serious competition. The Vu ActiVoice, on the other hand, is easily available from Flipkart. So it is up to the Indian consumers to decide whether they want to try their luck at the flash sales or pay around Rs 15,000/- more and get a TV which is actually available to buy. We would whole-heartedly recommend the Vu ActiVoice 55SU134. It has the capability to give a tough competition to the Mi TV 4. It is a solid piece of technology which will keep you entertained for hours and hours. 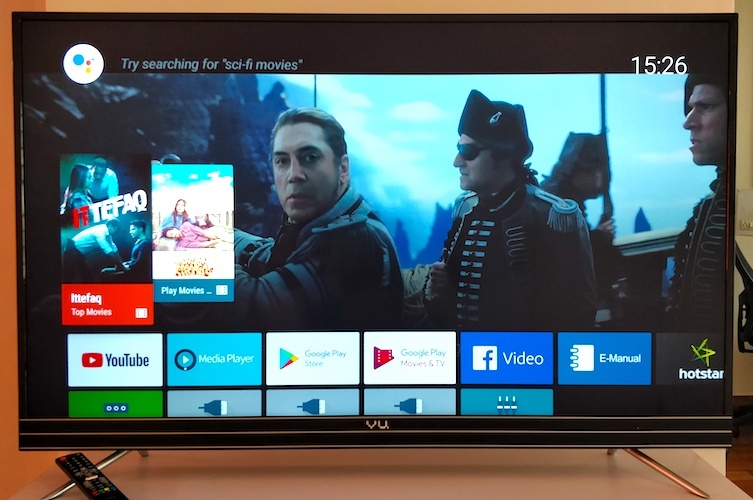 "55-Inch Vu ActiVoice 4K Android Smart Television: A Review! ", 5 out of 5 based on 2 ratings. 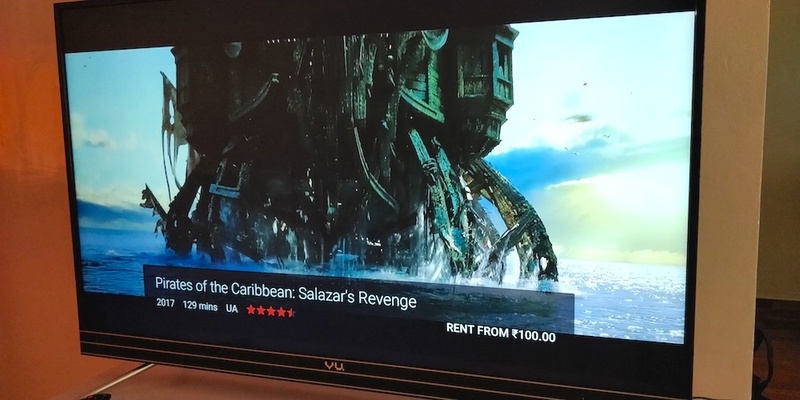 I recently bought VU 49SU131 49″ 4K Android TV and it’s good. Seen good pic quality and sound. Thanks to Flipkart for providing timely delivery and excellent service. Vu is the really good TV, this is the affordable price with high configuration. it’s service also good.